Odoo is the front runner in open source ERP applications available in the market incorporating every business need. Odoo.sh is a platform created by Odoo in Odoo Enterprise category. Odoo.sh is an Odoo cloud platform exclusively designed for the Odoo end customers. The implementation and deployment of Odoo.sh are highly recommended for the good of small businesses. Odoo.sh is an advanced platform comparing to Odoo online. Odoo online provides an instance of Odoo basics constraining the users with the usage of same level features provides by Odoo ERP. 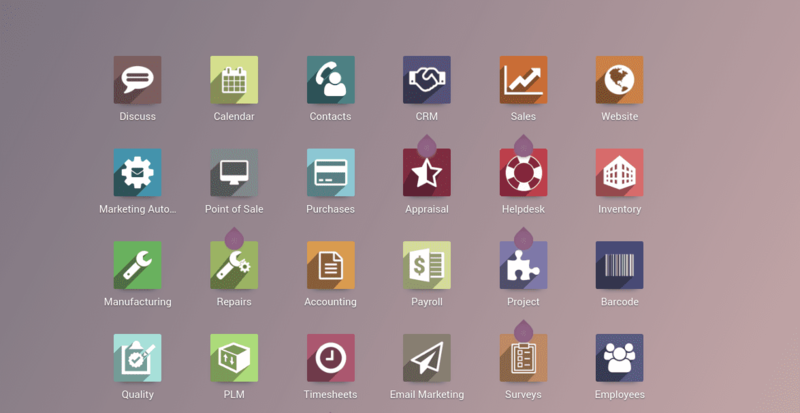 In Odoo Online platform, there is no provision to use any custom add-ons or custom development of the software which is required by almost every client on this earth as their processes are different, their business workflows are different. Odoo online is not that flexible compared to odoo.sh, as the installation of custom modules are not supported in Odoo online. We can only make the availability of Odoo pre-set modules here. Odoo.sh is scalar in nature allowing the installation of custom modules and further customizations. Odoo.sh allows the end users to easily test your developments, manage your feature-branches and beta-test your features on duplicates of your customer's production instance. Odoo.sh use Github account with unique SSH keys and secrets, where they can merge, clone and fork the projects. One can easily register their SSH public key and get connected to any server within few clicks. It is quite evident to watch the odoo.sh transparently getting integrated with Github development flow. > Odoo online is an Odoo SaaS platform based in cloud system. SaaS is expanded as Software As A Service ie Odoo providing a cloud-based system to all the end users as software service. With SaaS, one gets with full permission in accessing online software(via internet) for a regular interval with prescribed fees. 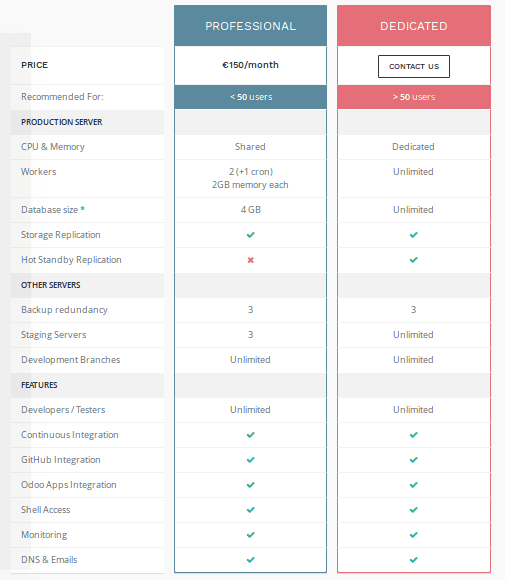 The major benefit of Odoo SaaS is that we don’t have to worry about the hardware, server or the infrastructure. > Odoo online is delivered via subscription. You can request for the Odoo online subscription through online within a flash of time. Within no time, you have an Odoo instance that you can use. > As Odoo online is an enterprise version, we can make available the Odoo studio app to make changes in the Odoo online. In some cases, Odoo introduces new modules for specific features like (vat, Indian GST etc), here the common end users need to install the modules manually. Odoo.sh deployment is a very easy process, just go to https://www.odoo.sh/project/create, later login to your Github account. > Select a git repository or create a new repo by giving a new name, later provide the subscription code to access odoo.sh. The Monthly subscription of odoo.sh cost is around 150 EUR. 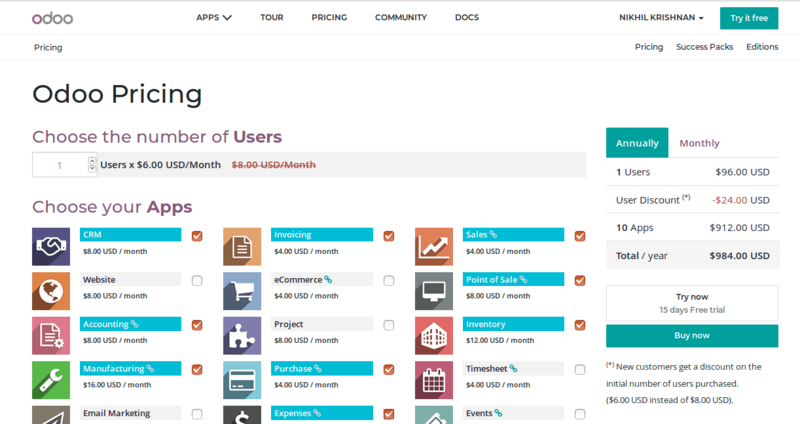 If you are an Odoo partner, odoo.sh subscription is absolutely free of cost. And last, select the Hosting location and odoo version (V10/ V11) too. Just click the deploy button. odoo.sh, connect with our GitHub account with real time. That enables you to clone, fork and merge your projects. > Then you can see the above view and finally click the connect button. You can see that your Odoo.sh is ready to use. 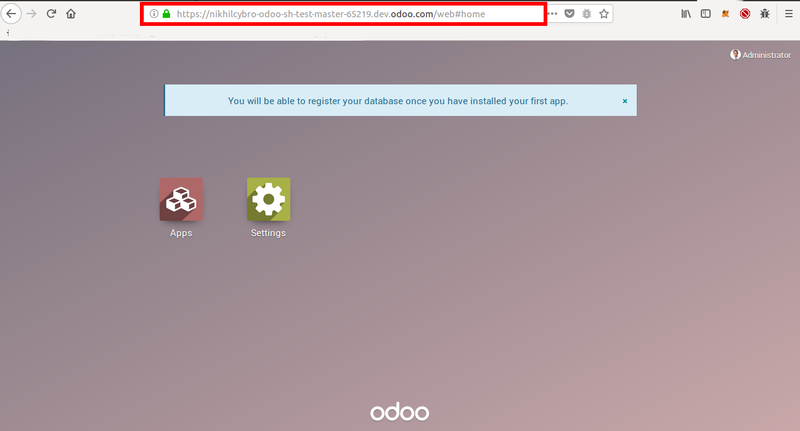 > Now you can use any apps from your Odoo apps by installing it. > Select the app you needed just click on it. > Fill the form and later use the app free for lifetime. > Click the buy button or Try it free for next 15 days as a trial. We can purchase online within this period. Or it will expire. > Now the odoo online is ready to use. 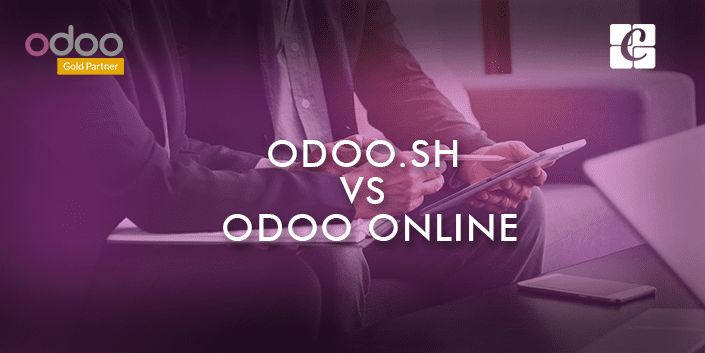 The task of maintenance is made simpler with both odoo.sh and odoo online. Odoo manages all servers for you like monitoring, backups, emails, DNS, ci, staging & production servers. Both cloud platforms are managed by Odoo itself. There is no need to worry about. > Odoo.sh, Take Incremental Backups. > Incremental backups on 3 different data centers, done twice a day. - Instant recover program is provided by Odoo. You can get any backups from the cloud in the most faster and easier mode within few clicks. You can contact odoo online service/Helpdesk to get or restore any of those backups on your live database. - In odoo.sh, you can use your own domain names for your ERP project. And also you can use DNS subdomains too. You can use the DNS subdomains for your development branches. 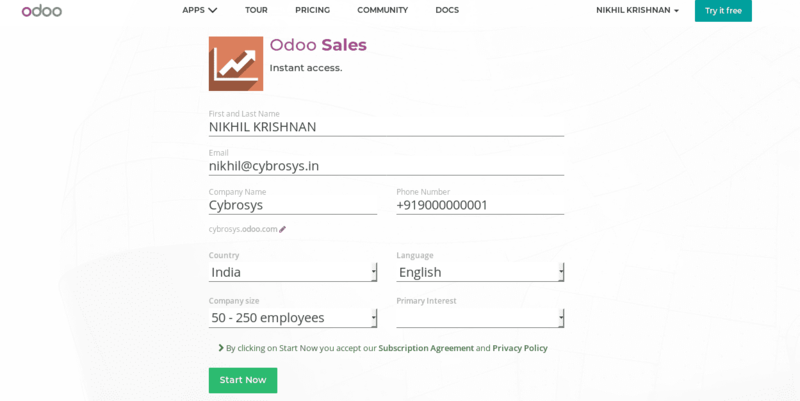 In odoo online, you don’t have to worry about the domain names. Odoo online support team is ready to guide you to set up your domain during the implementation time. - Odoo.sh and odoo online always to give maximum performance. PostgreSQL and Odoo are optimized for top maximum performance. 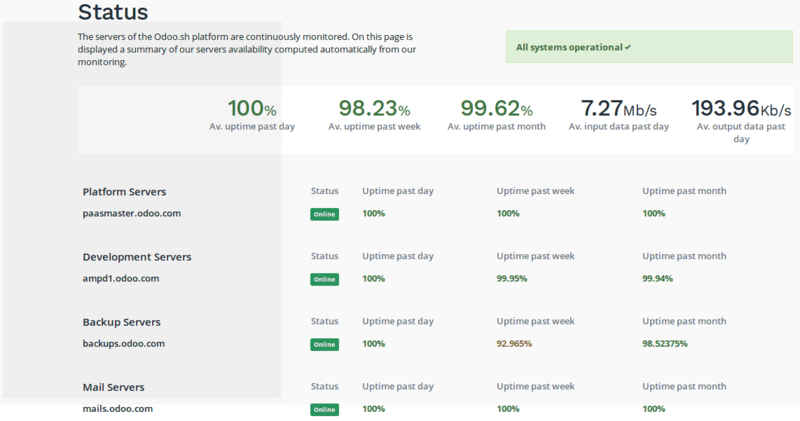 Get a status of all your servers, as well as KPIs about their availability and performance. > Hardware failure: It takes less than 5 minutes, to monitor and overcome the manual failure if the services hosted on bare metals are implemented with local hot standby replication. - RTO (Recovery Time Objective) = 24h for paid subscriptions, 48h for free trials, education offer, freemium users, etc. This is the time to restore the service in a different data center if a disaster occurs and a data center is completely down. - How is this accomplished: we actively monitor our daily backups, and they are replicated in multiples locations on different continents. We have automated provisioning to deploy our services in a new hosting location. Restoring the data based on our backups of the previous day can then be done in a few hours (for the largest clusters), with priority on the paid subscriptions. - We routinely use both the daily backups and provisioning scripts for daily operations, so both parts of the disaster recovery procedure are tested all the time. If we are in need of any another third-party integration or any other customization there is no way to do them in Odoo Online. But on the other hand, with Odoo.sh, we can add numerous new modules to satisfy our requirement. Odoo.sh test the custom modules and add them to our project. We can take clone, fork and merge to our project through our GitHub account. Every commit, pull request, merge or fork is tested, and deployed automatically. Other Odoo applications are available in the odoo apps, from where we can easily add to our project. It's a helpful feature that included in the odoo.sh. And also we can easily manage dependencies with the third party modules. Without any issues, we can update with what we want. In Odoo.sh each and everyone commits go through a thousand of automated tests, each modules/changes/ commits get tested automatically making the project error free and stabilized performance. Odoo.sh support more than one addon folders. If we add repository containing Odoo addons as A submodule of your branch, then it gets detected as an addon folder and will followingly include the addons path to the database. We can install those add-ons very easily and also install community modules to test them, in just a few clicks. (based on Git submodules). Odoo online does not provide server controls. In Odoo Online the server is completely controlled by Odoo, whereas Odoo.sh provides with server controls. We can get detailed and filtered logs available in the browser at a real time. In addition, Odoo.sh, provides wide support to run your project in both Odoo 10 and Odoo 11. That means we have the choice to select the versions of odoo, whereas Odoo Online only supports the latest stable version. We can get the shell access to our server or a container related to a build, with one click in Odoo.sh. > In Odoo.sh, we get a dedicated "runbot" for our project; a dashboard of all tests and also a detailed history and logs on all development branches to track progress in real time. An admin can easily drag the development branches to staging, test them with production data for the best experience. If you need, you can delete your Odoo project, with a development and hosting platform in few clicks. And deploy a staging branch to production in just a drag & drop, once if it's fully tested. Also, share the builds with our clients for the live testing. It will make to ease testing through public or private URLs. 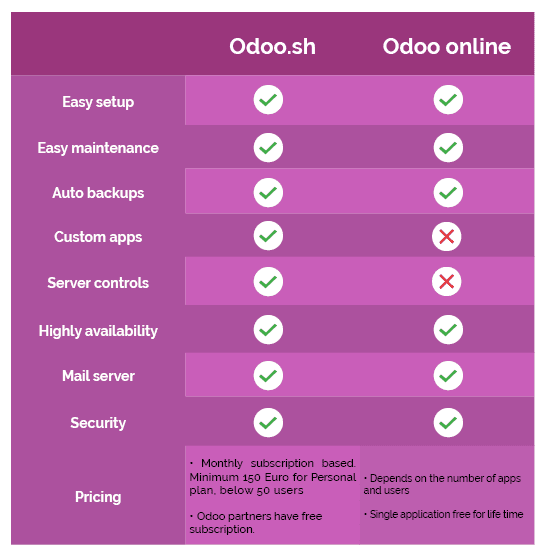 Both odoo.sh and odoo online provide mail server. And mail servers are setup automatically for us. Mails are deactivated on staging & dev branches. Oooo.sh provide a mail catcher to read them. From the help of odoo online support team, we can set up the domain for the server and can manage our emails using the same domain name. The professional plan recommended for a number of users that is below 50. The price is 150 euro per month. Dedicated plans rate not available is odoo.sh website, for that, you need to contact the odoo team directly. > Odoo.sh is completely free for the odoo partners. > Odoo online plans are purely depends on the number of users and number of applications used in out ERP projects. 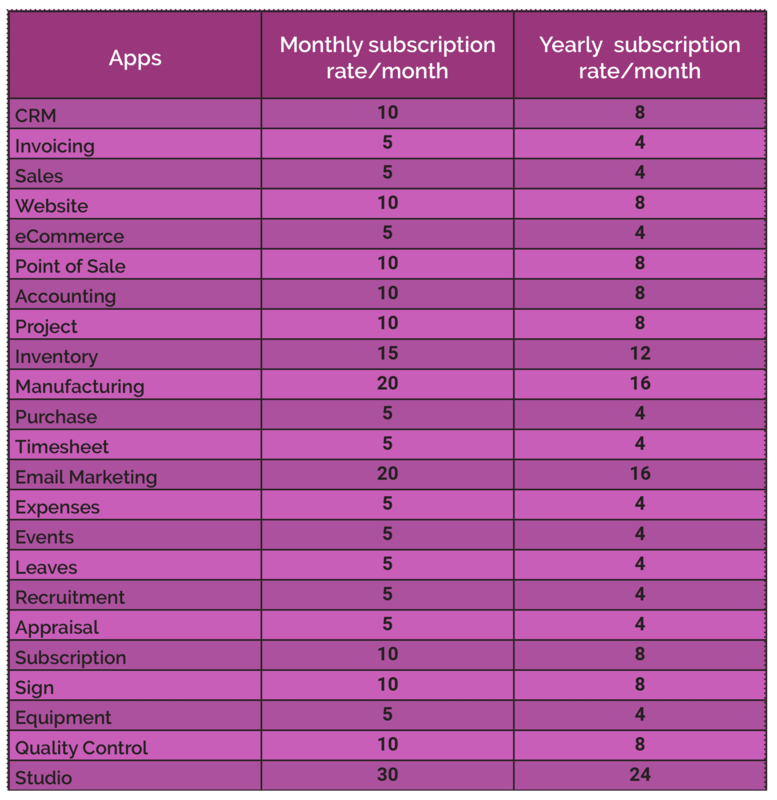 Odoo online have 2 types of subscription plans one is monthly bases and next is annually bases. Price of each applications depends on this plans. 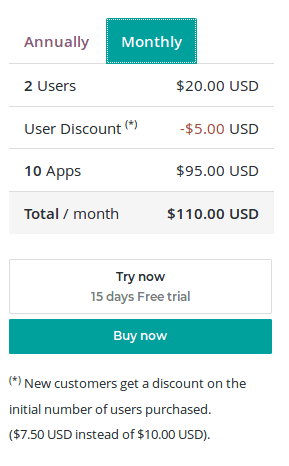 Total of the apps rate and number of users * 6 usd/Month will get the price of our project. > One application is completely free for the customer in odoo online. - We work with different hosting providers worldwide that always deliver at least 99.9% uptime guarantee. - This corresponds to a maximum unplanned downtime of 1.44min/24h or 8h/year. deliver a much better uptime than their SLA too. 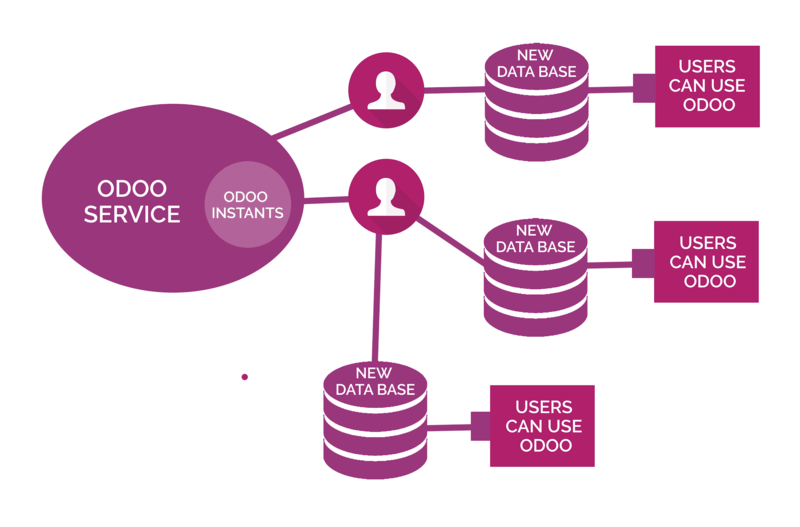 Odoo always guaranteed the security of the data of each customer in both odoo online and odoo.sh. This both odoo servers design and procedures focus on the security. - Odoo staffs do not have access to your password and can’t retrieve it. - All credentials are always transmitted through HTTPS Protocol with tight security. - Audit and control staff actions separately! SSL vulnerabilities, enjoying Grade A SSL ratings at all times. - The Odoo R&D processes have code review steps that include security aspects, for new and contributed pieces of code. 5. Each customer database is replicated in real-time on redundant storage located in the same data center, so a failover can happen quickly in case of hardware failure, with no data loss.